Katharina holds a PhD in Economics from the University of York (2005). Her previous appointments were at the Business School of Imperial College London (2010-2015), the Department of Econometrics and Business Statistics, Monash University (Australia, 2005-2010), the Centre for Health Economics, University of York (UK, 1999-2005), and the World Health Organization in Geneva (Switzerland, 1998-1999). 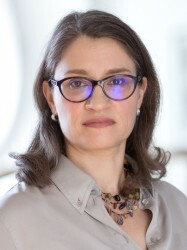 Katharina is a member of the Expert Networks 'Global Health' and 'Healthcare Delivery Systems' of the World Economic Forum, co-chair for Economics of The Gobal Fund Modelling Secretariat, and member of the International Decision Support Initiative (iDSI). She was a Postdoctoral Fellow of the Australian Research Council.